Rooftops for Reliability: Germany is using smart inverters to give solar a role in stabilizing the grid. California is following its example. Rooftop solar power systems are picking up a second job on the distribution grids that deliver electricity to California homes and businesses. Right now, their photovoltaic panels just generate electricity (meeting about 1 percent of the state’s consumption), but within a few months some systems will also start moonlighting as junior grid regulators—a role that could keep them busy even after the sun goes down. While the development in California is the result of a state-specific standard, approved by the California Public Utilities Commission (CPUC) in December, it is also part of a global movement: Germany, Japan, and other countries where solar is booming are implementing a similar change to empower rooftop solar installations to regulate voltage levels and perform other grid-support tasks. Solar’s expanding role is the result of upgraded inverters—the power electronics that link distributed generators such as rooftop photovoltaics to the grid. The inverters convert direct current from PV panels into a wave of alternating current that is synchronized with the AC grid. Inverters can also synthesize reactive power—AC whose current wave leads or lags the voltage wave—which grid operators worldwide use to control line voltage. Adding reactive power with leading current boosts AC line voltage. Subtracting reactive power (by adding power with lagging current) pulls AC voltage down. The new inverter standards mark a big change for equipment that utilities have viewed largely as a nuisance. 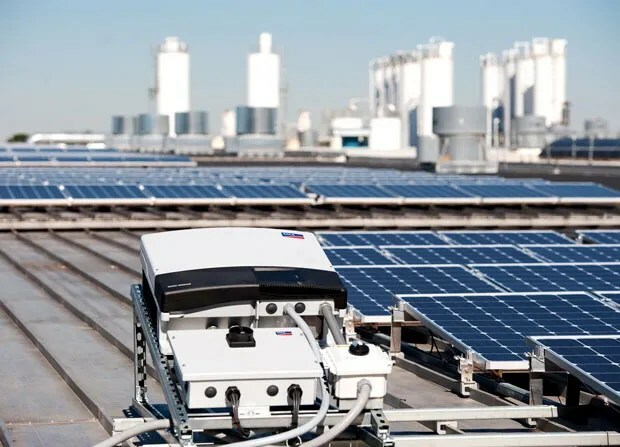 Standards have hitherto required solar inverters to shut down at the first hint of line trouble, in order to protect workers from unanticipated currents. “Traditionally, we’ve been looking for these devices to trip off with any hiccup on the distribution system. Now they are becoming a resource,” says Robert Sherick, principal manager for advanced technology at utility Southern California Edison. Utilities must adapt because maintaining power quality gets harder with rising levels of distributed generation. German grid operators were among the first to experience this when solar started booming there a decade ago. At times of low power demand, high solar output drove up voltage levels, explains Bernhard Ernst, grid integration director for inverter manufacturer SMA Solar Technology, based in Niestetal, Germany. Such situations prompted utilities to freeze PV installations on certain lines. Germany’s smart-inverter requirements, established three years ago, solved the problem by requiring inverters to start subtracting reactive power when output from their PV arrays exceeds 50 percent of capacity. This counterbalances the voltage-boosting impact of the solar power generation. Intelligent Inverters Arrive: Smart inverters can add or subtract reactive power to maintain line voltage. They also allow more rooftop solar arrays to share a power line. Compared with upgrading distribution feeders with thicker cables, smart inverters were a cheaper way to enable continued growth of PV systems, Ernst says. “We can install 40 percent more PV capacity on the same line with this functionality,” he adds. Germany also mandated improved performance during grid emergencies. In the event that excess supply causes AC frequency to exceed Europe’s 50-hertz standard by more than 0.2 Hz, inverters must now electronically trim output from PV panels instead of shutting down. 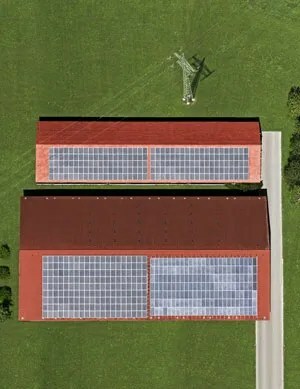 Frequency deviations are rare on Europe’s “electrically stiff” continental grid, but German regulators—worried about the destabilizing effect if PV systems turn off en masse—mandated an inverter upgrade costing owners and installers approximately US $300 million. California’s standard, developed through a collaborative process that began in 2013, pushes the envelope for smart inverters. Though solar causes few problems for California utilities today, rooftop PV is growing fast—by more than 40 percent per year in San Diego Gas & Electric’s territory. The state’s smart-inverter standard starts with Germany’s requirements and then asks inverters to be smarter still. Consider voltage regulation. California’s smart inverters will, like Germany’s, counterbalance PV’s direct impact on grid voltage. But they will also dynamically regulate voltage. If a smart inverter detects voltage exceeding 1 percent of normal, it will absorb additional reactive power. And if line voltage drops below normal—as can occur when passing clouds suddenly squelch PV power—the smart inverters will bolster it by injecting reactive power. In essence, the inverters act like tiny versions of the flexible AC transmission systems (FACTS) equipment installed in utility substations to manage flows on high-voltage power lines. And this act could ultimately be a full-time gig. At night, when their PV panels are silent, the inverters can keep running on grid power. Michael Turner, principal engineer for San Diego Gas & Electric, says solar installers will be encouraged to start using smart inverters within a few months. He also anticipates firmware upgrades by manufacturers that will give existing inverters the advanced functions required by the standard. Meanwhile, efforts are under way to incorporate California’s upgrades into the IEEE 1547 standard governing distributed power devices, which would accelerate smart-inverter use across the United States. Frances Cleveland, president of Boulder Creek, Calif.–based Xanthus Consulting International and the CPUC’s technical consultant on smart inverters, notes that even California’s standard is not mandatory until mid-2016. The idea, she says, is to give utilities time to work out the optimal settings for inverters on their systems. One potential issue they will be watching for is feedback between multiple smart inverters trying to dynamically adjust voltage on the same line—with some inverters absorbing the reactive power that others produce. Coordinated, real-time control of inverters could solve that problem, and California’s smart-inverter collaboration is already working on standardizing the communications links between smart inverters and grid operators to make real-time control possible. Southern California Edison’s Sherick says distributed inverters could be a fully integrated component of utilities’ distribution control systems within five years. By then, the CPUC hopes to have addressed another question with the potential to divide the hitherto collaborating smart-inverter developers: whether inverter owners should be compensated for providing grid-regulation services.